To date, chemoresistive gas sensors based on metal oxide semiconductors (MOS) have been the most attractive sensor types for the practical application. However, with the emerging concept of Internet of Everything, high operating temperatures over 300 °C of the gas sensors based on MOS must be reduced to achieve low power consumption and overcome a limited battery capacity of mobile devices. The 2-dimensional materials like MoS2 have been, therefore, one of the most recently studied materials for gas sensors with capability of operation at significantly lower temperatures. However, lacking selectivity toward various target gas species limited their application to gas sensors. 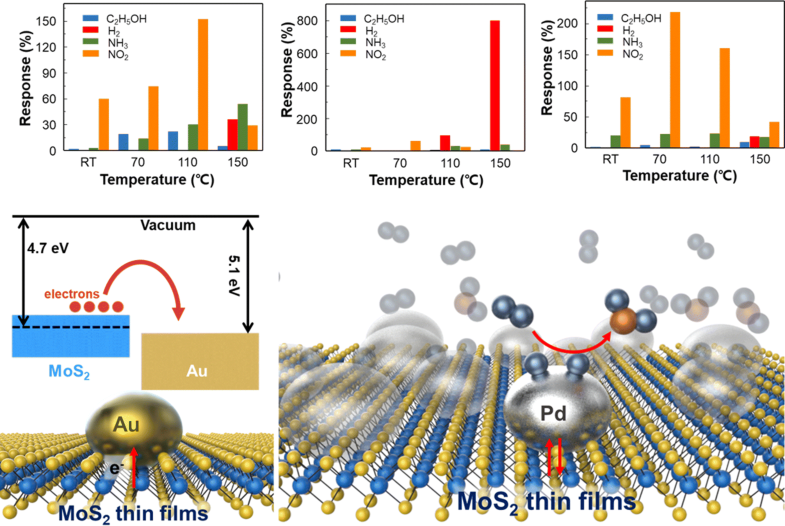 Herein, we investigated the effects of noble metals (Pd and Au) decoration on the gas sensing properties of MoS2 thin films. Due to the electronic sensitization of the noble metal catalysts and the formation of Pd hydride, overall gas responses and selectivity were significantly improved toward tests gas species. These results provide clear understandings on the effects of the surface noble metal catalysts on gas sensing properties of MoS2. Jun Min Suh, Young-Seok Shim and Ki Chang Kwon have contributed equally to this work. 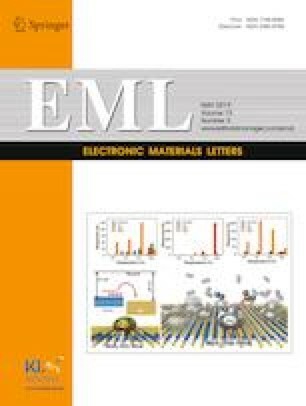 This work was financially supported by the Basic Science Research Program (2017R1A2B3009135), Future Material Discovery Program (2016M3D1A1027666), and the Nano·Material Technology Development Program (2016M3A7B4910) through the National Research Foundation of Korea, and the International Energy Joint R&D Program of the Korea Institute of Energy Technology Evaluation and Planning (20168510011350). J. M. Suh acknowledges the Global Ph.D. Fellowship Program through the National Research Foundation of Korea funded by the Ministry of Education (2015H1A2A1033701).